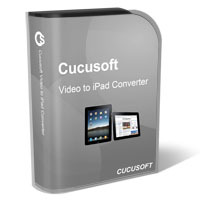 Cucusoft iPad Video Converter is the easiest-to-use video converter software for Apple iPad Movie and iPad Video. It can convert almost all video format, e.g. DivX, XviD, MOV, rm, rmvb,dvr-ms, MPEG, WMV, AVI to iPad Movie / iPad Video format. It is also a powerful iPad video converter with fast conversion speed. And the output iPad video supports iPad screen, you can enjoy your favorite movie on your iPad as a MPEG-4 Player. Now you can get this iPad video converter at a very competitive price! support various iPad video size including H.264 video up to 720p, 30 frames per second, Main Profile level 3.1 with AAC-LC audio up to 160 Kbps, 48kHz, stereo audio in .m4v, .mp4, and .mov file formats; MPEG-4 video, up to 2.5 Mbps, 640 by 480 pixels, 30 frames per second, Simple Profile with AAC-LC audio up to 160 Kbps, 48kHz.